Table of Contents, advance reviews, and March 2008 nationwide book tour schedule here. (NB: If you're looking for info addressing social issues in Japan, click for the Activists Page. Also click for the Otaru Lawsuit Information Site. Originally, I started this website in 1996 as a collection of mailing-list essays I thought might be interesting to others. Now, with over 3000 writings and materials at this domain name, I have split things into two, with this portion dedicated to providing "experiences for others' reference". I hope that people thinking about longer-term Japan lifestyles might consider a few angles and avoid some of my mistakes. This page also contains links to some humorous and anecdotal stories and reports about life in Japan. Click on a link in the Headings Section immediately following the book ad to page down to a teaser summary. If you prefer only published works, click here. (All recent articles can be found there without links from here--it's become too cumbersome to update all my pages whenever an article comes out.) If you want daily updates in real time, visit my NEW BLOG. Search Tips: I don't have a search function on this site, although Google might be of some assistance. Google has consistently provided the most hits on this site of any search engine. For a speedier search, I recommend you insert the word "debito" all in lower case, then a comma, then your key word or topic. That works for me. I try to have "www.debito.org" at the very top of all my new and revised sites. If it's something I wrote that has been published, I keep an up-to-date archive at my PUBLICATIONS PAGE, so stop by there too. "Japanese Only--The Otaru Onsen Refusals and Racial Discrimination in Japan"
"An important, trailblazing work that will go down in the annals of civil activist journals... Will be the book of reference on the subject for decades to come and should be required reading for anyone studying social protest." --Robert Whiting, author, The Meaning of Ichiro, You've Gotta have Wa, and Tokyo Underworld. "A powerful, poignant, and path-breaking docu-narrative." ---Ivan Hall, author, Cartels of the Mind and Bamboozled. SMALL REQUEST: If anyone uses these essays as a source in a publication, I humbly request the author notify me and, if it not too much trouble, to send me a photocopy of the publication by snail mail later. I also request that the author remain as faithful as possible to the context of the original in their quotation. Thanks. "JAPANESE ONLY" My first books (not including textbooks), on the Otaru Onsen Racial Discrimination Case, are currently on sale in Japanese (English version due October 2004). Published by human rights specialists Akashi Shoten KK. More information, reviews, and ordering details here. ..you are asked for your "Gaijin Card". ..you are stopped by the Japanese police. ..you are arrested by the Japanese police. ..you see a "Japanese Only" sign. ..you are refused service at a business catering to the general public. ..you are turned away at a hotel. ..you want to protest something you see as discriminatory. ..you want to take somebody to court. ..you want to get a job (or a better job) in Japanese academia. ..you are having a labor dispute in the workplace. ..you are swindled in a business deal. ..you want to get Permanent Residency (eijuuken). ..you want to become a Japanese citizen. ..you want to run for office. ..you want to build a house. ..you want to get a divorce. ..you want to do some awareness raising. And more. Updated and added to frequently. Don't see exactly what you're looking for? Start at the very top of the "What to do if" site and see what headings are on offer. Reports and Counter-Reports on how Japan deals (or doesn't deal) with domestic issues of discrimination. Japan has a very mixed record on human rights, especially towards ethnic minorities, non-citizens, and other people born of distinction within its society. When signing the UN's International Convention on the Elimination of Racial Discrimination (CERD) in 1995, Japan promised to take measures (including legislation) at all levels of government to eliminate racial discrimination "without delay". Despite this, Japan to this day remains the only developed country without any form of a law at any level outlawing discrimination by race. the government's claims of sufficient protection from and redress for racial discrimination are simply not true. The UN is aware of this situation. This information site, focussing on the interaction between the GOJ and the CERD Committee, will demonstrate how Japan's government wilfully abdicates its international responsibilities, and lay bare what ideology is used to justify it. The website author has compiled three reports in one place for ease of reference and readability, with notes and links added by the author to highlight contentious points. The author hopes a wider knowledge of the situation may persuade a recalcitrant Japanese government to keep its international promises, and enshrine in law the fundamentals of a society with more opportunities for all its members and residents--regardless of race, color, historical or national origin, or other criteria socially preordained by birth. "As a world power in an era of globalization, Japan has to expand to the outside world. But its society is still closed, spiritually and intellectually centered." The world has now entered the 21st Century, with the promises and problems of global and "borderless" societies. Japan too has itself found itself in the throes of an inevitable internationalization, with record numbers of resident foreigners, registered and unregistered, year on year. Yet even though international residents pay taxes and contribute to Japanese society the same as citizens, there are several societal and legal barriers to them enjoying equal rights and social treatment. In fact, overt exclusionism remains largely unremedied, often by Japanese Government (GOJ) design. 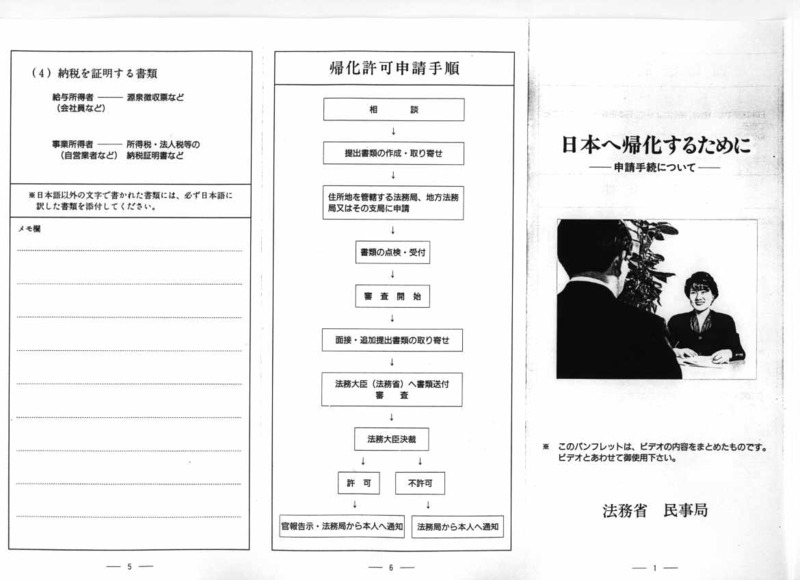 This info site, the text of a handout I distribute at all of my speeches, will describe several social and structural problems that warrant attention, and in the end propose some modest solutions to make Japanese society easier for everyone regardless of nationality to live in. Click on the picture to for a link to the Sealion Tama-Chan Site, celebrating his of newfound Residency Status (as opposed to taxpaying foreigners, perpetually unrecognized on "Juuminhyou" Residency Certificates in Japan). Joining his ranks as a recognized Japanese resident is fictional character "Tetsuwan Atomu" (Astro Boy), in Saitama, April 7, 2003. But not generations of ethnic Koreans and Chinese, not to mention every other foreigner in Japan, who cannot technically be "residents" unless they have citizenship. WHY? AND IS THIS A GOOD THING? Click to have a look see here. WHY DIDN'T THIS HAPPEN IN THE OTARU ONSENS CASE? 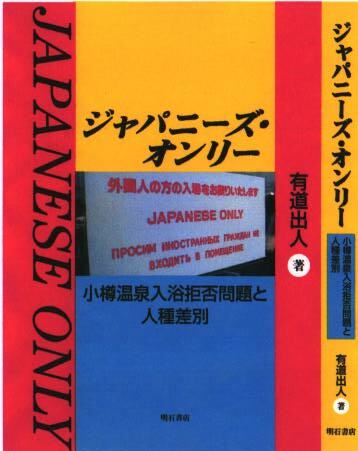 (Sign in Russian: "Japanese Only Establishment". Monbetsu, a seaport city on the northeast Okhotsk Seacoast of Hokkaido, Japan, has since 1995 had "JAPANESE ONLY STORE" signs displayed on as many as 100 bar and restaurant doors. Produced by the local Restaurateurs' Association, these signs, rendered in Russian only, have been used to exclude all "foreign" clientele, regardless of connection either to Russia or to Japan. Although the Ministry of Justice's Bureau of Human Rights demanded in July 2000 that this signposted discrimination cease immediately, a fact-finding mission, carried out Nov 15, 2003 by Olaf Karthaus and Arudou Debito, revealed that signs are still up more than three years later. In fact, other businesses, such as a restaurant, a karaoke parlor, and a public bath funded by tax monies (a "Dai-San Sector" enterprise), have put up new exclusionary signs of their own. However, enforcement is haphazard--foreigners (and foreign-looking Japanese) can be admitted if they speak Japanese, or are accompanied by a Japanese speaker. Nevertheless, our requests to have the signs taken down were rejected for the time being. Karthaus and Arudou will be returning in the winter months to resubmit a Petition (chinjou) to the Monbetsu City Government asking for the establishment of an anti-discrimination Ordinance (jourei), which if passed will make this activity, currently not unlawful in Japan, illegal in this municipality. INFORMATION SITE WITH NAMES, DATES, PLACES, PHOTOS AND ARTICLES HERE. turning international business away from Japan. Dedicated to those who think "Japanese Only" exclusionism in Japan is not getting worse. Have a read. July 2003 was a busy month for the bigots in Japan. Statements from the uppermost levels of Japan's political arenas demonstrated that any opportunity is a good one for painting dire pictures of foreign crime. Especially if they might get some new public policy out of it. 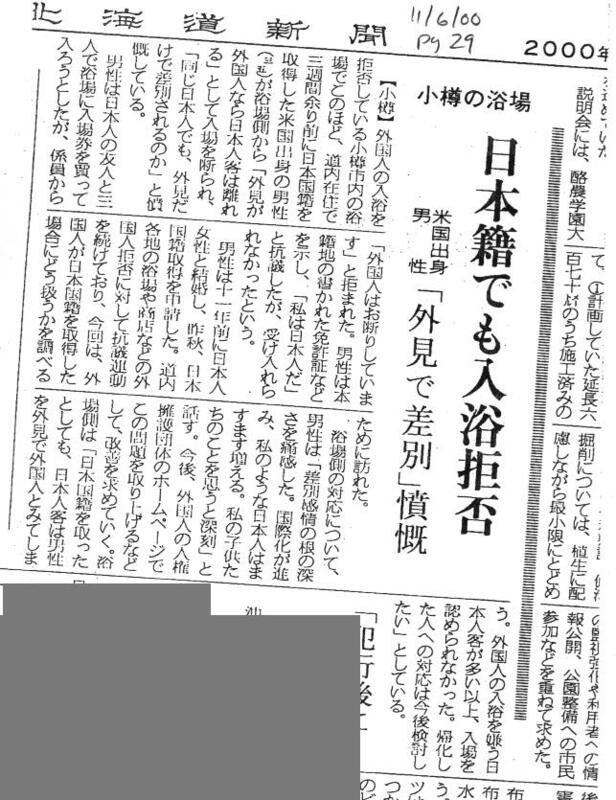 On July 12, Dietmember Etoh Takami claimed that "one million foreigners" in Japan are "murderers and thieves". Then on July 11, the Koizumi Cabinet linked a heinous killing of a Nagasaki child by another (Japanese) preteen with "Brazilian youth crime". On July 28, after appointing a cop as vice-governor, Tokyo Governor Ishihara went on a tour and bashed Ikebukuro as a hotbed of foreign crime. All this has caused immense social damage in Japan--to the point where a government survey reveals tha only about half (and markedly dropping) of Japanese respondents believe that foreigners deserve their human rights protected! Yet what happens when Japanese go abroad? On July 17, the Japanese Government announced that crimes by Japanese abroad are rising,too! By September, however, even the Europoean Union reported that after seventeen commissioned studies, there was no evidence that increased immigration led to an increase in the crime rate. Read all about it in this essay. For those who read and watch the Japanese press, these are scary times. Foreign crime is allegedly on the rise, members of the new Koizumi Cabinet are making clear policy statements against it, and the National Police Agency is ready for a new push. This despite incontrovertible evidence that foreign crime both as an absolute and a rate is miniscule compared to that of Japanese crime. However, the English-language media is ignoring this impending policy putsch (which may dramatically affect their readership's civil liberties in Japan), instead focussing on economic reform (probably to avoid scaring away foreign investors). What is going on? That is what this essay will discuss. With things on the move in the highest levels of government, ow is the time to woolgather before things become entrenched as law, and I hope that the journalists out there will see the issues involved as worthy of overseas attention. Yes, this is an essay from experience. My wife got elected to the town council in Nanporo, Hokkaido, in April 2003. Advice on how to run a grass-roots campaign is available at http:// www.debito.org/nanporo2003elections.html, with links to other elected candidates who also have strong international connections. Japan has had widespread reportage about the alleged "Foreigner Crime Wave". This is a myth. Turns out the foreigner crime rate is actually far less than the Japanese rate. I speculate that the Japanese police are deliberately trying to generate mass hysteria through selective reporting of statistics, in order to increase their budgetary outlay (in the same successful way they did for the alleged threat of hooliganism during the World Cup 2002). An article I wrote for the Japan Times Zeit Gist Column. Have a read. Speaking both as a Sapporo resident (my city being the site of the contentious England-Argentina match) and a naturalized Japanese citizen (who attracted police attention with his foreign features due to the overall media-stoked fear of hooliganism), I think it was too early for Japan as a society to have hosted the world's most popular sport. I offer some on-site observations, newspaper articles, photos of exclusionary signs and opinions of agents who profited from them, and opinions on the overall fiasco that need not have happened if Japan as a society would have understood soccer as a sport better beforehand. All Japan's media and police wound up doing was making life uncomfortable for its international residents--and still offer no apologies for overdoing it. Tokyo should be a fun place to cycle around, especially at night whe traffic is light. Not so. If you look like a foreigner, you may be stopped on suspicion of theft. I found out for myself in May 2002, and wrote it up for the Japan Times Zeit Gist Column. Have a read. And here's one of the surprise harbingers. On Oct 31, 2000, Dave Aldwinckle, then newly-minted Japanese citizen named Arudou Debito, dropped by Yunohana Onsen (Otaru-shi, Temiya), one of the many establishments in Hokkaido which refuse service to people ostensibly on the basis of extranationality. 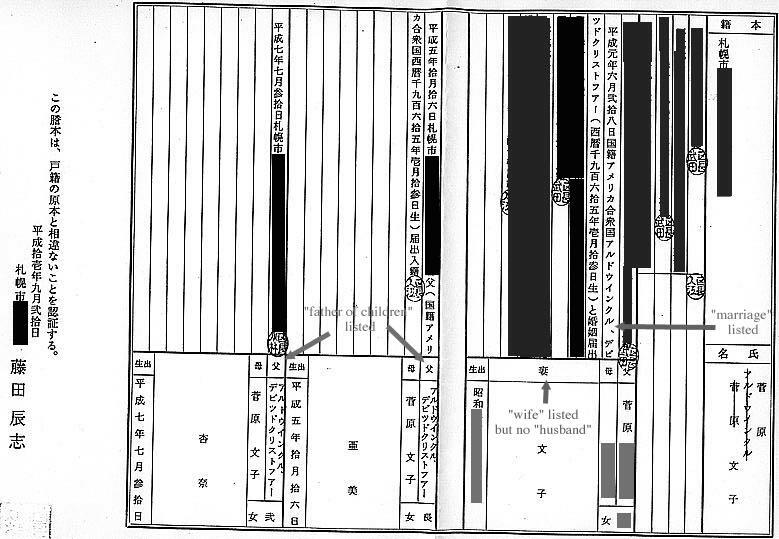 Even though this was no longer an issue, the person on duty at Yunohana refused Arudou Debito entry, even after the latter showed his new driver licence (which has his proof of honseki) and was acknowledged by the person on duty as a Japanese citizen. The reason given? In paraphrase: "We staff understand that you are a Japanese, but our customers would not just by looking at you. There is a danger that our customers might stay away if you come in, so we have to refuse you admission." Hence their "Japanese Only" rules draw lines on the basis of race, not nationality, calling into question the ability of the Japanese Constitution to protect not only its residents, but also its citizens, including children of international families, who look foreign. A website with information and background on exclusion of foreigners all around Japan. And if that isn't enough, we happened to bring a tape recorder along with us to record the event and the conversation at Yunohana on October 31. This is one reason why on February 1, 2001, two friends and I filed A LAWSUIT AGAINST YUNOHANA ONSEN AND OTARU CITY. Too much to tell you right here. Just click on the link to go to a special page, with hundreds of articles and reference materials in English and Japanese. 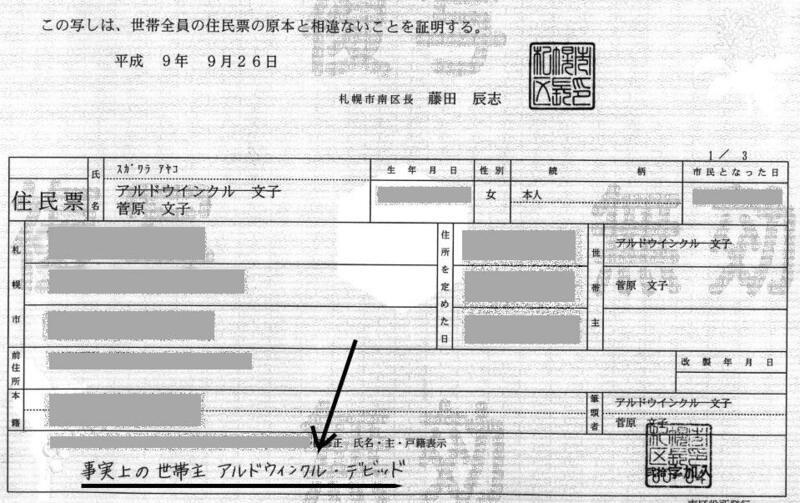 In November 1998, I got stopped for an ID check by Tokyo Metropolitan Police in Haneda Airport for no apparent reason. Lodging a harassment complaint, I entered into personal negotiations with Haneda authorities and the police themselves. Their express reason for being stopping me? Because I am a foreigner, they said, and therefore suspicious. Also because they can--in the line of duty. I then hit the Japanese law books to find out our legal rights. Turns out what they did was illegal under UN treaties that Japan is signatory to, and not entirely legal under domestic Japanese law either. And it is something they would hardly ever do to a Japanese because, legally, they cannot. This is an information site which describes the mindset the police have towards people they see as foreigners, and provides detailed quotations of the law and observations on your legal rights. I suggest you print up and carry the letter of the law around with you to display whenever the police get obstructionist. Concise Japan Times article on this subject: "Know the law: As terror fears cause crackdown, foreign residents should know their legal rights" (July 27, 2004). More about "What to do if..." (something of this ilk happens) here. By law, since foreigners are by definition not citizens, we cannot have a "Residency Certificate" (juuminhyou, in kanji: 住民票), ergo we do not actually "reside" in Japan. Not only is this an affront to our contribution to society (we pay resident taxes like anyone else), this legal loophole has created a number of systemic horror stories for non-Japanese--such as your Japanese spouse looking legally unmarried and your children bastards. You can also see the root of this problem--the fact that I am not listed as a "person" in the "names rank" at the bottom of our family's Family Registry (koseki touhon). Excerpts of my wife's koseki touhon are here, demonstrating that I am the spouse of my wife and father of my children, but not a "husband" in the appropriate name column--despite having our marriage recognized in Japan as legal as any other marriage by citizens. Not more than six months after this came up as a topic in 1997, many people have been emailing me with the good news: the legal loophole works! In fact, people (usually male non-Japanese, mind) have gotten their names listed on their spouse's juuminhyou AUTOMATICALLY! The bureaucrats even had a copy of my wife's papers right there that they had downloaded! Spooky! Since then, other people have written in saying that this site has helped get them juuminhyoued. Consider doing it yourself. Meanwhile, this issue is attracting more and more attention. 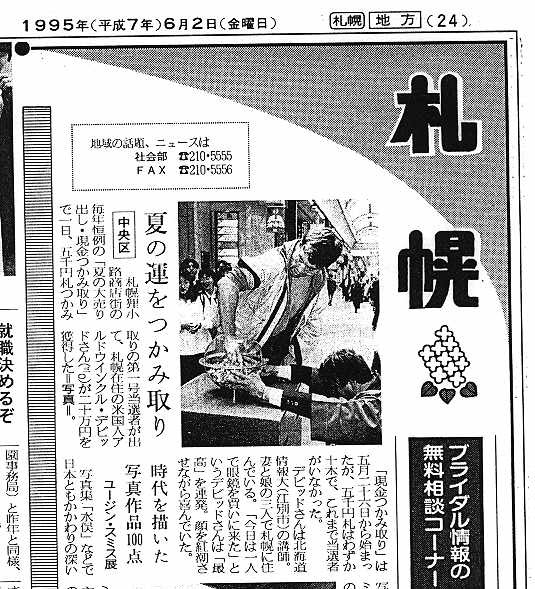 See my "Watashi no Shiten" article in the Asahi Shinbun of Nov 8, 2003 (Japanese). Also Japan Times article here (January 20, 2002). Despite all the alleged international friction in port towns up here, Hokkaido's biggest port, Tomakomai, stands out as a beacon of international exchange without exclusion. This is in no small part due to The Missions to Seamen, Tomakomai, a haven and information center for people employed in the most transient of occupations--the waterborne trades. This report analyzes the life of a sailor, the workings of the organization, and the prospects for applicability in other troubled seaport towns throughout Japan. Japan has had some very alienating fingerprinting laws, which were instituted after WWII to control and track foreigners. Several people took an active stance against this practice in the 1980's, some even taking their case before the Japan Supreme Court. One activist, columnist Kathy Morikawa, gave HIBA (Hokkaido International Business Association) a very thorough talk on her long march in November, 1998. As I was Secretary of HIBA, I wrote up a report for the HIBA NEWS. Because of heroes like her, Permanent Residents like me can get away with signatures on our Gaijin Cards, and the whole fingerprinting system may be abolished in the near future. Entire text of newspaper article on the abolition of the system on this URL. UPDATE: Brief article on the abolition in the New York Times, Aug 13, 1999. Part One: "GAIJIN WA NIHONGO GA KATAKOTO NO HOU GA II YO NE"
Kume Hiroshi, flippant Anchorman of popular program NEWS STATION, made a glib comment about non-Japanese that causes outrage amongst the foreign community in Japan. I respond by telephoning the network to lodge a complaint, only to be brushed aside. But it doesn't end there. A story of protest from a newly self-aware minority in Japan--the non-Japanese residents. After a meteoric rise (pity meteors don't rise), the issue faces the nay-sayers. Fukuzawa contrarians begin to chisel away at the legitimacy of complaining. "What's wrong with the word 'gaijin' anyway? Aren't we being 'politically correct' here?" My observations are on how non-Japanese aren't used to working together as a minority group, and find themselves unable to cooperate with one another. In response to the naysayers above, I describe exactly what the word "gaijin" means and why it is in fact a racist term. b) Daily Yomiuri's William Penn comments in "Televiews"
On becoming Japanese or "Japanized"
Ever wondered how hard it is to become a Japanese citizen? What are the requirements? I compare both America and Japan in this essay that may or may not inspire you to change your citizenship. c) The 100 Questions on America the US Immigration and Naturalization Service asks its applicants to screen them. 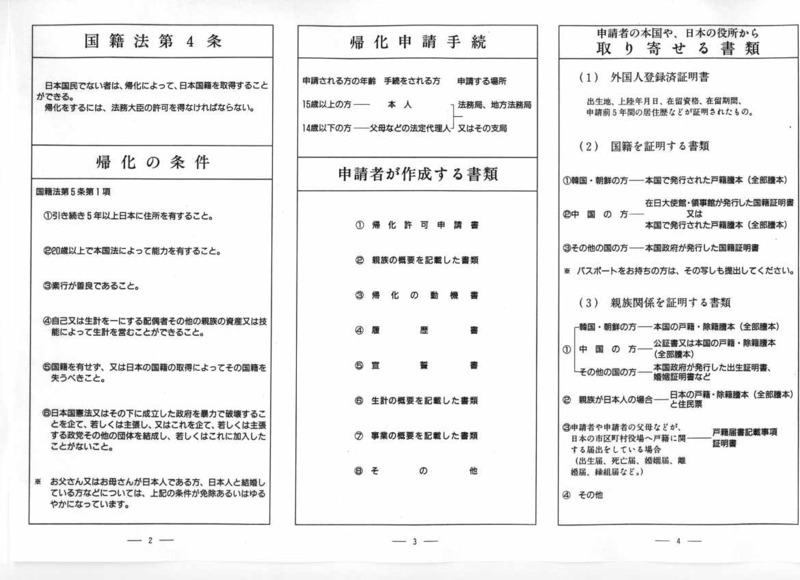 d) Or if you are less ambitious, a brief overview of requirements for getting your PERMANENT RESIDENCE IN JAPAN. 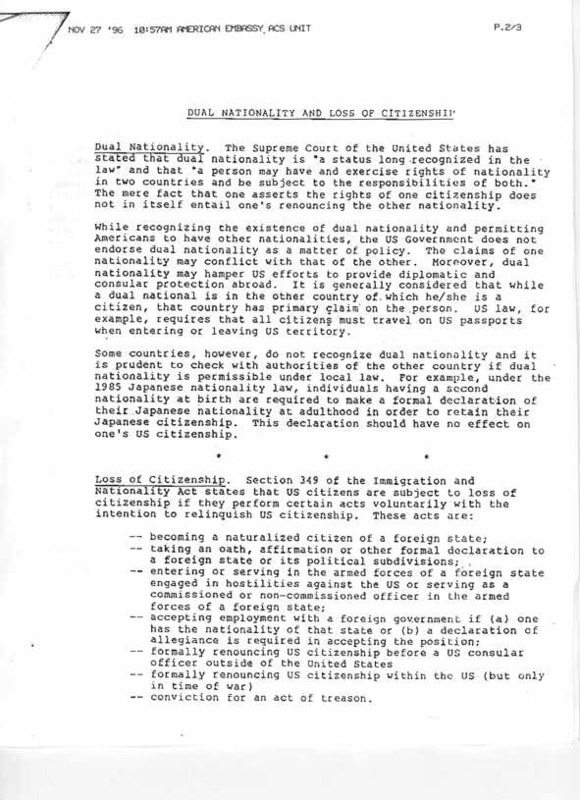 e) The US State Department's policy on Dual Nationality (it is possible), and how one can lose American citizenship: jpeg pages one and two. Yup, I did it. Became a Japanese Citizen. How? Read. Why? Ditto. NEW YORK TIMES ARTICLE, "Turning Japanese--it takes more than a passport" (Nov 29, 2000, page 4), gives more details on my case. It may be seen on the NYT website at http:// www.nytimes.com/2000/11/29/world/29JAPA.html or else as text here. 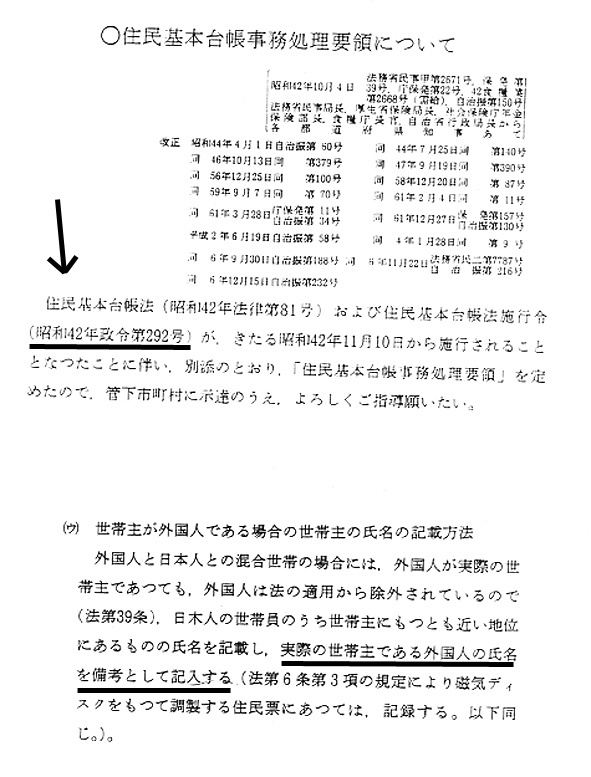 If you're still wondering just how obtaining Japanese citizenship may or may not avail you of the trappings of assimilation, here's something less fun: an April 2002 report on "JAPANESE ONLY" SIGNS AROUND MISAWA AIR BASE, where foreign hostesses employed by cheap local bars still refused me entry despite me showing my Japanese passport! A tale replete with ironies indeed. People who come here to live and work often have no idea what they are getting into, or how they can make the best of (or even make sense of) a culturally-ambiguous situation. This essay is a keynote speech I gave to some transplant educators called JETs (on the Japan Exchange and Teaching Programme) in both February and May, 1999, who face difficult roles as cultural ambassadors in the Japanese outback. I describe what sorts of cultural phenomena found specifically in Japan will adversely affect mental stability, how one can deal with them, and how one can increase job satisfaction by negotiating his or her own role in the community and the office. 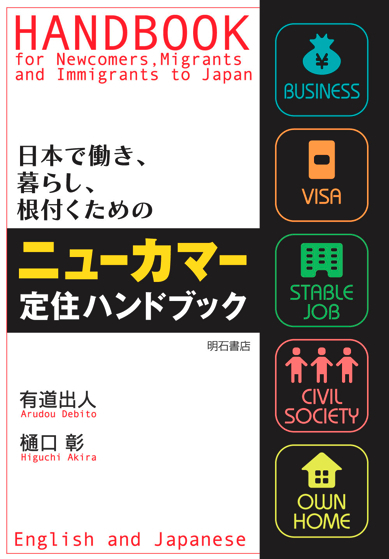 Particularly recommended for those who have shallow or no experience in dealing with Japanese workplaces. 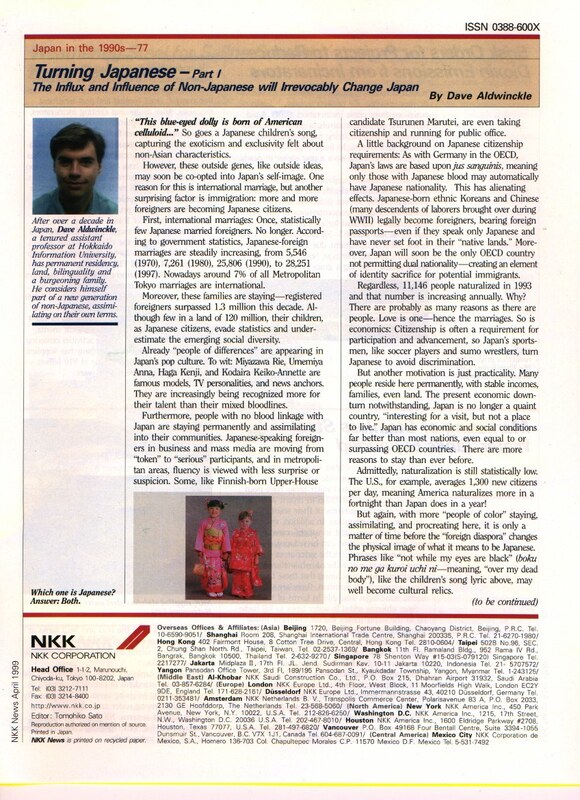 April 1999 (color jpeg) on why Japanese society will undergo a sea change in the not-too-distant future--as more foreigners are staying, having children, and even naturalizing. The very image of "Japaneseness" (black hair, brown eyes) may have to be revised. 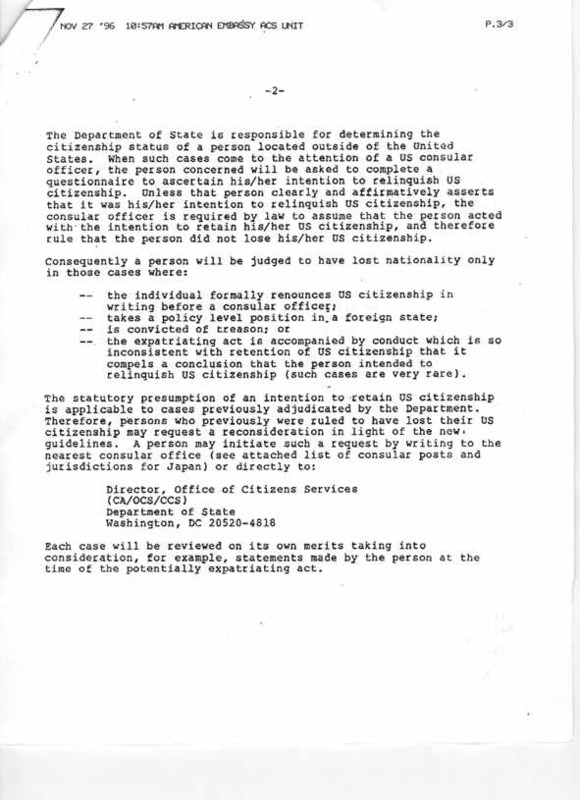 May 1999 (color jpeg) describes how difficult the procedures are for naturalization into Japan. I was asked to attend one of those suspicious "international communication in the community" associations, which local governments throw money at but usually have no clue how to use. I agreed to attend only on the condition I can have some real input on events and proceedings, which I was granted. So I sat down and wrote out a brief presentation on how to be more "culturally sensitive" from the word go. An attempt to de-programme open-minded people from the ubiquitous "wareware Nipponjin" phenomena, which so often pre-empts any attempts at productive international communication. Eventually, after taking a very active role in the formation of the first annual international gathering, I undertake a workshop there to raise community awaredness, entitled ,"Towards a society more receptive towards cultural differences" (ibunka ni kanjusei no aru shakai e, Japanese here). It went very well. I would suggest people who want to see how to make a difference in Japanese society have a look at these essays and see what is feasible in their neighborhoods. I was asked by Japan's bureaucracy to give a 2 1/2 hour talk to representatives of all major ministries, on how to better serve the public, particularly non-Japanese long-term residents. I gave several concrete proposals for easing our assimilation into Japanese society. I was called back for an encore by somebody who attended the above Jinjiin talk. Only problem was that it was hard to talk about "gaijin rights" when a) they couldn't do much about issues of nationality anyway, and b) they wanted economic policy suggestions. I'm no economist, so not only did I have to rewrite the whole speech, I had to do it from a standpoint of ignorance. Luckily, with a lot of help from my friends, I slapped something together. INTERESTING TANGENT: IS DAVE ALDWINCKLE BECOMING DAVE SPECTOR? Questions were raised by one DFS member about the efficacy of my speaking to the Japanese government at all. As I am admittedly unqualified as an economist, was I just using my Japanese skills to prostitute myself? Want to further the cause of assimilation a bit? Here's how you can make your voice heard more effectively. This is the handout to a talk I gave with Daniel Walsh, of Hagoromo Junior College, Osaka, at the JALT (Japan Assoication for Language Teaching) Annual General Meeting, Omiya, Saitama-ken, on Sunday, November 22, 1998. Tips on how to know your audience, how to know your venue, how to make the hosts inspire your speech, and how much financia l compensation you should get for your monumental efforts. The Japanese academic job market, never very open to overseas educators, is becoming even more abusable, as demonstrated by recent court cases which have created legal loopholes exclusively for foreigners. I suggest to those who are considering a post at a Japanese university to reconsider. I suggest to those non-Japanese already working in Japan to stay here and watch out for their rights. Don't be fleeced and sent home. Know how to tell the difference between the stable and the temp jobs. Basic criteria for judgment are here. An abridged version which appeared in Tokyo Classified, May 15, 1999, pg. 25, is here as a jpeg, as well as a full-blown academic essay published in JALT's The Language Teacher magazine, July, 1999, pp. 14-16. 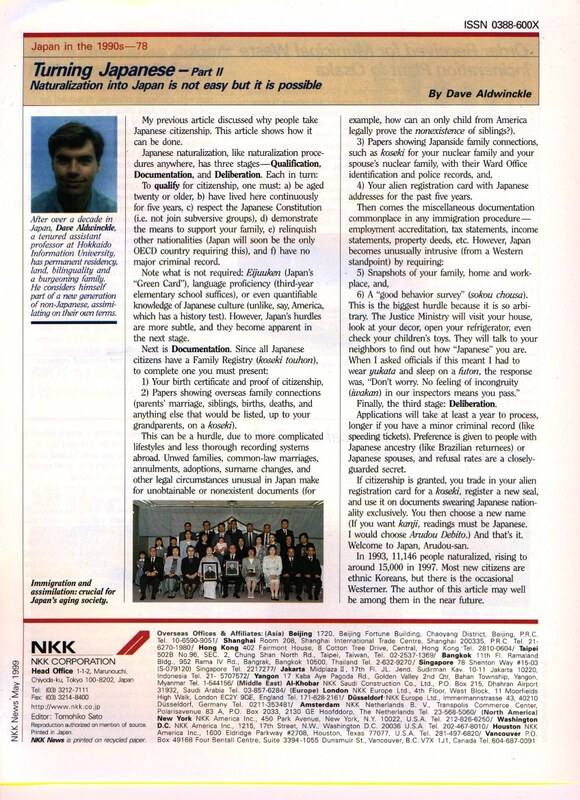 NINKISEI UPDATE AND ROUNDUP, co-authored with Fox and Shiozawa, published in JALT's The Language Teacher, issue dated August, 1999. The Japanese university system is full of pitfalls. Most (yes, most) full-time foreign educators in Japan suffer or have suffered from temporary job status in a system that differentiates not on the basis of qualification, but nationality. Don't be fleeced and sent home. Know how to tell the difference between the stable and the temp jobs. Basic criteria for judgment are here. An abridged version which appeared in Tokyo Classified, May 15, 1999, pg. 25, is here as a jpeg only. WHAT DECENT JOBS ARE THERE FOR NON-JAPANESE IN JAPAN, ANYWAY? A very rough, preliminary essay, waiting for comments from more walks of life. Had to start somewhere. Contribute if you can. My elder daughter started her education at a Japanese kindergarten (youchien) in April 1998. I went to her school Orientation and saw what I consider some of the roots of conditioning into "Japaneseness". Still a work in progress, as we haven't reached the upper echelons of grade schooling yet. ISSUES OF JAPANESE PRIMARY SCHOOL EDUCATION PART TWO: UNDOUKAI (SPORTS DAYS). Undoukai are annual events in Japanese education, and they involve about as much preparation and fuss as a major American holiday. Skeptical? Follow me through one sunburnt day in July, 1999, when I sit there gritting my teeth not only at the inordinate length of the event, but also at the apparently militaristic nature of it all. Quite frankly, I can't stand undoukai, and based upon the feedback I include with this URL from other international families, I am not alone. If you go to school in Japan, chances are that your teacher will drop by your home and want to get to know you a bit more personally. Sometimes that includes asking to see your child's bedroom, inquiring about sleep and study habits, and perhaps indirectly getting a lowdown on the economic situation of the family. When I heard about this in April 2000, I cried, "not bloomin' likely", and demanded my wife move the tete-a-tete to a site other than our house, thinking that this is the state coming to snoop and get a pipeline into our private lives. "Reactionary tosh," replied my wife (not in so many words) and several other readers of my essay on the subject. Read my opinion and the views I got from cyberspace and see with whom you agree. And in the end, it did make a difference, it turns out. The following year, the note from school advising legal guardians of the event offered them a choice to have the visit at home, at the school, or not at all! See 2001 Update here. We did it. So can you. See how here. An introductory essay on the hurdles involved in buying land and building a house here. Forget cultural explanations--here's the real reason why Japanese save so much. With the sudden demise of Hokkaido's biggest bank, we realize that we'd better receive our house loan now while the going is good, and start building a year earlier than planned. This is an update of Part One above,with details on 1) what goes into a good Hokkaido house, 2) how one gets a loan for it, 3) what trade barriers we face, and 4) how we were disappointed with an American builder's lack of effort to get around them. If for some reason you want to see our house's specs and sketches, click here. On with the saga. The pressure increases when we realize that if we want to get the house built before winter, we'd better sign a contract. We also realize that our builder has concurrently done some accounting magic--raising the price of the house by 25% right before our eyes. [This kind of accounting magic is not normally the product of an online accounting degree.] This posting talks about our eleventh-hour negotiations to push the price down again (with jpeg of an actual building estimate), as well as tangents into a) the value of importing and b) how to get around government interference and trade barriers. A how-to primer for the amateur importer. I describe how I got all my stuff from the US to Japan, with photos, asides on Japanese tariffs, Customs procedures, and just general money-saving tips. The most practical of all the Housebuilding essays. An excerpt from my as-yet unpublished novel. I assert that MBA-trained Western businesspeople in fact face a disadvantage in highly-cartelized Asian markets, because they are taught to compete with each other rather than cooperate. Based upon my experiences in a quasi-MBA program at the Graduate School of International Relations and Pacific Studies, UC San Diego. I was asked to appear as a panelist on a Japanese TV show for the first time in Spring 1997. What about? Something warm-fuzzy like my feelings about being a foreigner in Japan, right? Wrong. About Japanese airfares. Say what? They needed an American to give the American side of airline deregulation. This long post juggles themes of regulation and change, information collation, and use of the mass media as a means of information dispersal. I learn first-hand just how tough it is to be a reporter. This is an article I wrote for the May 1999 edition of the HIBA NEWS, a monthly newsletter I have been editing since 1997, on Hokkaido International Airlines (Air-Do). Mr Fukuki, head of the Eigyou-bu, came as our guest and told us how hard it was to get the airline, one of two upstarts challenging the hegemony of Japan's Big Three, off the ground--with obstacles thrown up by airplane sellers, domestic carriers, and even the Ministry of Transportation! Read this and understand why I thought I would fly the Sapporo-Tokyo corridor via Air-Do from now on. Until, alas, AIR-DO decided to treat foreigners differently and wilfully give them inferior service. See what I mean here. A narrative-style essay on how Japan's government-sponsored program, "Japan International Cooperation Agency", described as a way to promote technical training in the less-developed world, is actually a means for Japan to secure future markets for its goods. This essay is dated, but I thought it would be worth posting here for the time being. Sony, along with a whole bunch of other Japanese companies during the late-80's "bubble years", bought big into theAmerican economy. N ow fortunes have changed, and Sony is the only one holding onto its investment. And losing big. An article from ENTERTAINMENT WEEKLY with my updates on Sony's bath in the movie and music industry. If it's not one thing, it's another. After months of price wars and consumer- oriented competition, Japan's gasoline companies started colluding in Spring 1997 and established a floor price that so far everyone is following. A case study of how Japan's capitalism through cartel foils any moves, however earnest, towards deregulation. So you don't think I'm just a curmudgeon. A tight little satire written for japantoday.com during the Suzuki Muneo vs Tanaka Makiko Diet feuds back in 2002, speculating on what would really come out if only pathological liars like Muneo (who happens to come from Hokkaido; oh, the shame of it) were to come clean. I am of course an incredible driver. Too incredible by half, it seems. I recently got my driver licence suspended for too many tickets, and had to jump a few hoops in the Japanese legal system to get it back. A humorous eyewitness account of how no-nonsense the Japanese Department of Motor Vehicles is, and how a society usually known for its intolerance of lawbreakers treated me with exceptional clemency. I am an even more incredible driver as a result, especially since my "criminal record" may in fact have disqualified me for Japanese citizenship! Have you ever wondered how the often-ceremonial Japan salutes the death of a loved one? An eyewitness account of a recent funeral for one of my more eccentric cousins, who committed suicide. PUBLICATION! The above "Japanese Funeral" Essay gets published by JPRI ! It is in a much richer format than the original, for when I realized I'd better take things seriously, I did more research. I received from a mailing list a bunch of jokes about how living overseas acculturates you on an unconscious level. Originally titled, "YOU KNOW YOU'VE LIVED TOO LONG IN JAPAN WHEN...", it included chortlers like, "you squat when waiting at bus stops", or "your mom wants to know what 'genki' means when she phones and asks you how you are". I wrote a reply and made it more specific to the effects of life in Japan's Great White North. A pundit offers his perspective of the shortcomings of US business through a parable of a boat race. The punch line is that Japan wins through American incompetence. I then answer with a parable of my own, but from the Japanese side as I see it (with footnotes, for those who might not get the jokes). An essay best read by those who know something about Japan's political scene, this describes a recent series of infomercials that political parties used in the 1996 General Election. Highlight: Hokkaido is targeted in a hilarious LDP ad done to a Japanese rap beat! Special guest star Randal Irwin, the person who sold me my first web site location, as "The Token Gaijin". An early narrative written in 1992, this is an amusing excerpt from my as-yet unpublished novel describing my tribulations with osake to onna. A Leonard-Maltin style quick review of (dated) movies dealing with this archipelago, with ever-glib opinions about whether or not they are worth a look. .A stranger comes up to me suddenly in the street and wants to practice his English. I tell him I'm not interested in giving free lessons to just anyone. End of story, but my conscience nags. Am I obligated to talk to strangers anytime, anywhere, because they want practice, or am I allowed to be off-duty from being an English speaker? Ever wonder why Japanese tend to be so comparatively thin and Americans tend to be so fat? Speculation and some data. If a non-Japanese asks for a Japanese's hand in marriage, will there automatically be trouble from the Japanese in-laws? I describe my experiences and ask Fukuzawans to comment. 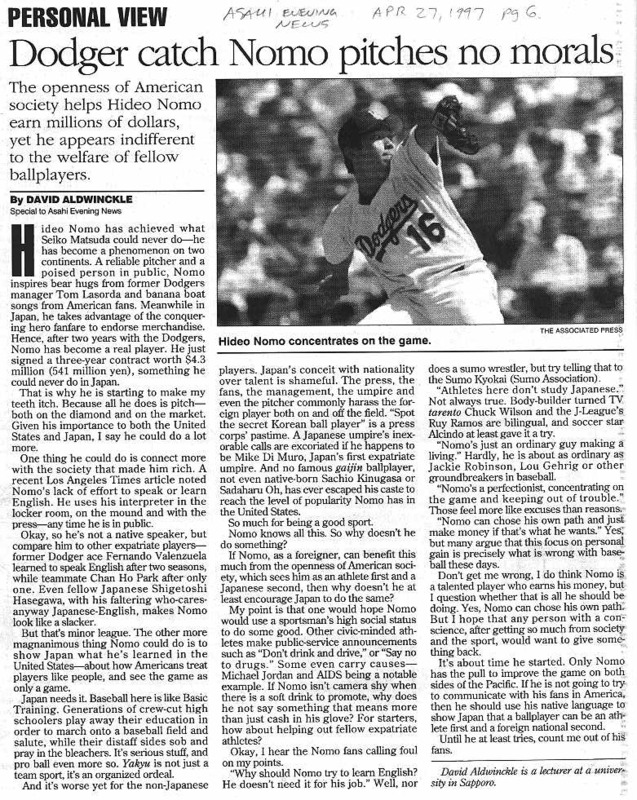 Although I am not an avid baseball fan, I read an article that Japanese ball player Hideo Nomo is not trying to learn English. This is despite playing two years for the LA Dodgers (at the time of this essay) with a great expat package, and signing on for three more. I decry him as lazy, and moreover unhelpful to his fellow foreign ballplayers in Japan. To the ire of the relativists, libertarians, and sports fans. Bullies in Japan have a special amount of power not often seen in the West. I show in a negotiating situation how my using bullying tactics actually accomplished a lot more than I had expected. HUMILITY AS A WEAPON--FIGHTING "JAPANESE-STYLE"
This is a little tale of my trials when travelling to New Zealand with a Japanese tour group. The leader of our "international exchange society" was sexually harassing one of our members, and when I stepped in to help her, I became the target of the leader's smear campaign. However, I used a few Japanese-style tricks of my own and actually turned the tables. An informal sociological study. By the way,, I submitted a much briefer version of this trek to All Nippon Air's WINGSPAN Magazine 1997 Short Essay Contest. It didn't win anything, alas. Getting satisfactory medical treatment in Japan can be a real pill. Having a baby here even more of a pain. And we've gone and had two of them. This topic deals with the trials I went through in trying to have a hospital comply with my delivery room wishes. A woman on the now-defunct Dead Fukuzawa Society network comments on the disparity between the treatment of foreign males and foreign females by Japanese society. In her view, the gaijin guy enjoys a sexual playground with abundant Japanese girlfriends, while the gaijin gal faces famine in her love life. The debate heats up with remarkable sentiments that Japanese women are to blame for this--as conniving competitors snapping up men who either don't know any better or are "losers" in their own societies. In a post designed to elicit comment, I claim that while the feast and famine phonomena are certainly true, there is some fault to be assigned the American women (the only ones I can comment on from experience) for their own state of affairs. A contentious trio of essays not to be read if you are either in a good or a bad mood. One fine morning just before Shunbun (Spring Solstice) 2001, my wife says to me, "Hey, you're a Japanese now, so you should come with me to the Buddhist temple (otera)." I buck at this equation of religion and nationality, and take the issue to the internet. Within 36 hours I receive several dozen very helpful replies from friends, the best of which are reproduced at this URL. A personal view of what it's like to tour the building, then sit in on two Diet sessions and see PM Koizumi report on his anti-terrorist meetings with President Bush on September, 27, 2001. Amazing is the amount of building space in a public legislature still allocated for the exclusive use of the Emperor. FOREIGN REPORTAGE ON JAPAN: "GUSH AND MUSH"
Ever notice how far off-target foreign journalists get when talking about Japan? A lot of "gush" (they over-sing the praises of the place to the point of inaccuracy) or "mush" (they report onthings that are irrelevant and immaterial when analyzing the world's second-largest economy). I write a contentious essay which notes that those journalists truly have their work cut out for them--for their overfrequent lack of Japanese language ability, coupled by the systemic Japanese cartelization of information for image control, makes it inevitable that they get it wrong. My points are dismissed by non-journalist critics as mere pat "conspiracy theory", but my second essay outlines the evidence for information cartelization. Finally, a journalist comes forth and really gives us the lowdown on the systemic obstacles facing journalists everywhere. A delightfully enlightening debate. 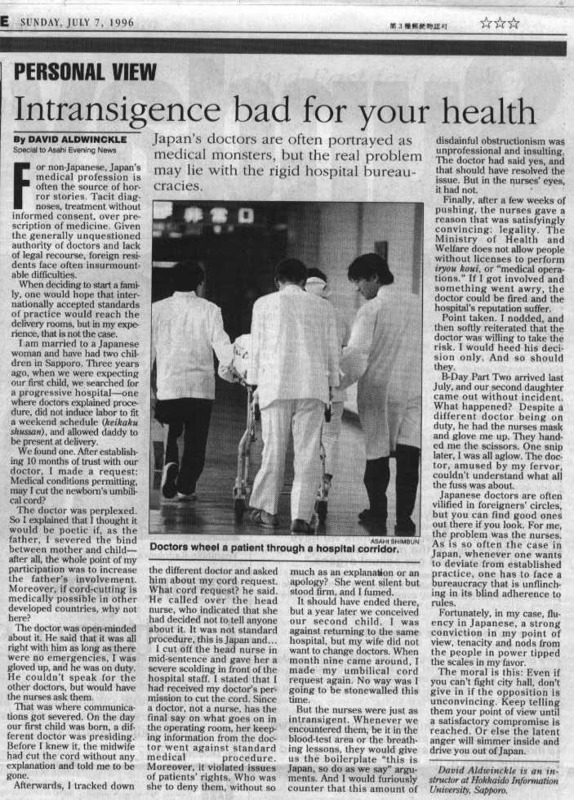 OUTRIGHT FABRICATIONS: MISQUOTES BY GREGORY CLARK, JAPAN TIMES COLUMNIST (where Clark erroneously cites a 2000 USA Today article, and refuses to either rectify or retract his comments despite corrections from the public and from the original article's author, Peter Hadfield), Japan Times, February-March 2005. IS JAPAN REALLY ALL THAT SAFE A COUNTRY? Essay on our being burgled here in Sapporo, and finding out that my wife didn't think the Japanese police were worth a damn--having been ignored by them when she was nearly raped. An account of my personal experience teaching Japanese soldiers the English language, I go out on a limb and speculate that 1) Japan's "pacifist society" has a military that wants to get stuck in overseas, and 2) Japan's social structure seems to apply best to a military setting. I come out in support of Japan's tight measures against drug smuggling, saying that it makes me feel better about sending my kids to school here. Unaware that this issue was currently political capital in Clinton's reelection campaign, I get flamed by a person who knows far more about the issue. Admitting my ignorance, I then respond on the issue of drugs in general, regardless of society. AMERICA IS AS DISCRIMINATORY AS JAPAN? A Japanese professor claims on Fukuzawa that America is just as biased as Japan towards people with differences. I argue against that. When I claimed (within my Housebuilding Four essay) that the tons of rice stockpiled in the same warehouse as my imports were part of the ploy to keep foreign rice out, an individual sends a post so laced with propaganda I couldn't help but flame back. A collection of travelogues with photos describing our six-week trip Eurailing around Europe Summer 1996, divided into territory. As the adventure is cumulative, I recommend reading them in order. I went back to the States for four weeks that summer, filling a shipping container with house stuff and seeing friends. Along the way, I learned how much ten years of living in Japan has affected me-- "un-Americanized" me, so to speak. A bit deeper in premise than 1996's EUROTREK travelogue, AMERICATREK 97 contemplates the surprisingly tenuous links between culture and identity. This summer I spent six days on the road, most of it alone, cycling around this fine island we call Hokkaido. Laced with travelogue, humor, and observations less on the human condition and more on the condition of this particular human, I challenged myself to make a rather tiring trip into something readable and interesting. See for yourself if I succeeded. Ever wondered what it would be like to join the Peace Boat (http://www.peaceboat.org), either as a passenger or an instructor? I spent close to three weeks aboard on Voyage 48 during the winter of 2005. While this series of essays is not restricted to Peace Boat boosterism (I also talk a lot about leaving Japan for the first time in five years, and what kind of effect it had on me), this series should give you some idea of how fun and stimulating it can be to study human rights afloat. A one-off essay (which started off as a thank-you note to my hosts) describing my August working and travelling around California--for the first time in fifteen years since grad school in San Diego. It's not as trite an essay as it might sound, as I ruminate on California lifestyles, meeting old friends and seeing the life paths I could have taken, and even ingratiating myself (actually, not quite... you'll see) into the very home of one of my college mentors, Chalmers Johnson! Give it a try. There are even photos. If you want daily updates in real time, visit my NEW BLOG. I may not be able to answer everyone promptly due to a perennially full mailbox, so please be patient. And please write subject lines that are unlikely to be snagged by spam filters. A simple "Hi" won't reach my inbox, sorry. I get hundreds of spam messages a day nowadays, alas. Yoroshiku! taken from a genuine exclusionary business sign! NOTE: This offer is completely independent of my book "JAPANESE ONLY" (Akashi Shoten 2006), but it is a good way to raise awareness of the issue. Most people would rather pretend these signs don't exist. Too bad. They do. Keep the issue alive in the public eye in the best of satirical traditions by wearing your heart on your sleeve, and the sign on your chest! Go to the "Activist Page"